Get parachute cord by-the-foot for cord that has no give - great for precise handling. 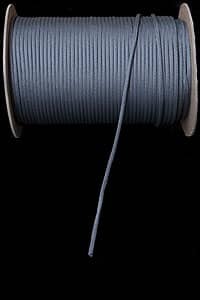 This is the nylon cord that came standard with our old style flowleashes before flowcord. Thin and rigid. Depending on your use, you might need small o-rings. Click here for o-rings - choose the small ones. Check out this video for how to install and customize your leash set-up. Instructions for small o-rings are from around 4:10, but look at the first half for an overview.